I am writing a book about the 7 Elements of Life that, if mastered, will enable you to Live a Healthy Life Past 110. The 7th Element is Happiness. The 6 other Elements are very important but happiness is the element that makes it a complete package. This article is just one part of the happiness chapter, there will be more aspects to ponder when I finish the book. Pictured below are two who were with me on my sailing odyssey, looking into their eyes you know they are experiencing happiness. Happiness is a mental state that can be reached by people in the ghetto or by multi billionaires. This is my concept of happiness as I lived it. I lived in the country ghetto when I was growing up. We didn't have running water in our house in South Jersey. In the winter when we had to walk over a city block through the woods to get water from an artesian spring. It was an experience. Were we happy, very much so, our parents loved us and we knew it. My Father made $5,000 per year and we always had enough to eat and my Polish Mother made breakfast, lunch, and dinner for us that was always a festive occasion. We raised chickens and turkeys and had a fantastic garden. We sold some of our turkeys to people in our town at Thanksgiving and Christmas. We all had many chores to keep the family functioning. Through the years I had to feed the animals, bury our garbage, take care of the garden, wash the dishes, deliver newspapers for the Philadelphia Bulletin seven days a week, and my biggest responsibility was to go into the forest and chop down trees for our furnace to keep us warm through the late fall, winter, and early spring. We didn't have money for coal to feed our massive furnace in the basement so it was my brother's and my responsibility to gather the wood and saw it into logs for the furnace until I was 11, when my brother was about to be drafted into the Army. He decided to join the Air Force and became an officer and was the navigator on bombers for the Strategic Air Command, he flew all over the world. He was the only cadet in his class who had not gone to college, after the Air Force he went to college. Now it was my responsibility, at 11, to get the fuel necessary to keep us warm. I went out into the forest every day after I finished school and delivered the newspapers on my route. I had to find appropriate size trees, chop them down, and cut them into lengths that I could drag home. I would then start cutting the trees into logs to fit into the furnace in the basement. When Dad got home from work he would help me finish cutting the trees into logs. My Father left for work at 5:00 AM every morning to fight for an opportunity to work every day on the docks of Philadelphia, loading and unloading ships. My Father was a heavyweight boxer, a drummer in a band, and a pitcher on a baseball team in his younger days so he knew how to fight. In the movie "Cinderella Man", Russell Crow depicts an older professional boxer who has to work on the docks to support his family. In the movie he is shown outside the gate of one of the ship loading areas. The foreman inside the gate throws the little metal chits over the fence and whoever had one after the fight could work that day. I didn't know that my Father had to do that until his partner at work told me they stood back to back with their foot on a chit until they had knocked down everyone near them so they could pick up their chits and work that day. I was told this by his partner at my Father's Funeral, my Father never told us he had to do that and he never came home without work. Back to the forest, I would go out alone and chop down trees, even back then I knew not to just take all the trees close to the house. The only trouble was that as the years went by I had to go further into the forest to get the trees and drag them back but through the years I got bigger and stronger. I still remember the echo of my ax cutting into the tree as snow was falling all around me, it was romantic, I was happy, I was contributing to the happiness of my family. When it was freezing cold outside at night and we were all warm in the house, I felt good. We all contributed to our survival and I think a team effort in the face of adversity creates happiness when you succeed. Today it is harder to find happiness, our children are bored and very few contribute to the family unit, my children included. I give them chores but they are not necessary for our survival and they know it. 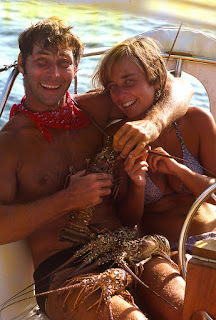 When I was in my 30's I went back to survival mode and lived on my sailboat for three years. I wanted to find out what I was made of and wanted to see if I could live as our ancestors did, as hunters and traders, without depending on our complicated system to supply our needs. I lived for five months that way, in the 700 islands of the Bahamas, without any money, and became extremely healthy and extremely happy. I have lived life through many financial cycles since my younger years, with large homes with a staff of 4 nanny's, a housekeeper, a chef, and a gardener. Was I happy at those times, yes, but I was more happy when I was living on the edge, where almost everything I did was tied to my survival. Your moments of living on the edge are your slices of life where you are the most alive. In the times of adversity and triumph, that is where you find the most intense happiness. There is a message to this story and it is not that you should leave a comfortable life and go an a dangerous adventure to find ultimate happiness. The message is that happiness is in your mind, I could have told a different story about how terrible it was growing up and how frightening it was to be living on the edge. All of us can find some kind of happiness anywhere. There are stories about people finding happiness in concentration camps. Happiness is a tricky thing, you can not have ultimate happiness if there is no conflict in your life. We are hard wired to feel happiness when we succeed over adversity. If you have everything and lack conflicts, find a cause, help people achieve success, start a company with a product or service you believe in. If you are unhappy because you are living under dangerous conditions, have a frustrating job, a bad relationship, problems with your kids, or personal mental or physical difficulty, you have a conflict and in working your way out of it you will find happiness. Happiness is arguably the most important element of the "7 Elements" to a long, healthy life. The other Element in the list of 7 of next importance is "Supplements". The information on this website about supplements is worth reading. After studying supplements for 38 years and seeing the recent research that proves CoQ10 can reverse congestive heart disease and Omega 3 being prescribed by psychiatrists for depression, I see that proof is developing rapidly for supplements to reverse and stop most of the other deadly diseases. So read as much as you can or ask me questions, it can add many healthy years to your life.